So I had some time to kill after I took my Chemistry final tonight, since my lab partner was giving me a ride home and I finished the test an hour or so before her. I forgot to bring a book to read and since I was done with the class I didn’t really feel inspired to read the only book that was currently in my possession- my Chemistry text. I wandered the corridor hoping to find a newspaper or something lying around, but all I could find were several copies of the school paper. 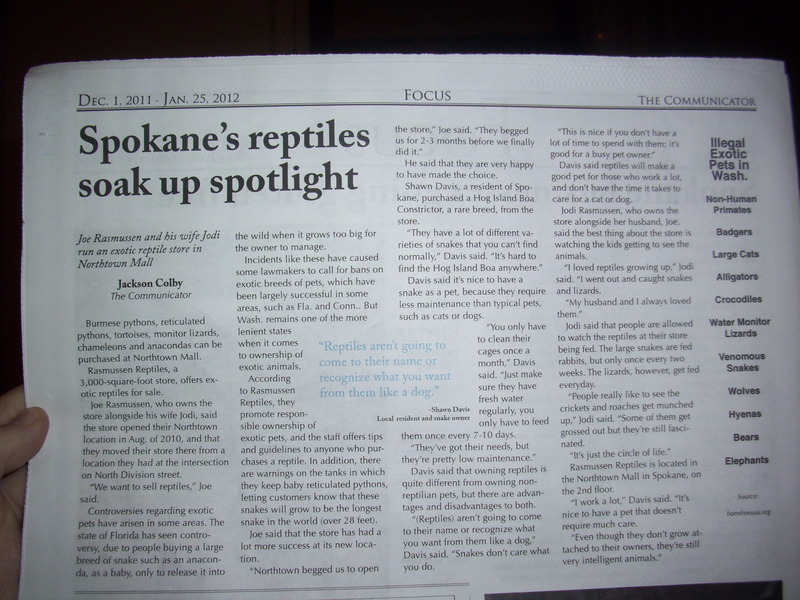 Even though community college papers aren’t really my thing, I was bored enough to read through it. It was mostly a pretty generic college paper, until I got to the back. The back is where I struck gold. First of all, this is just good information to know. 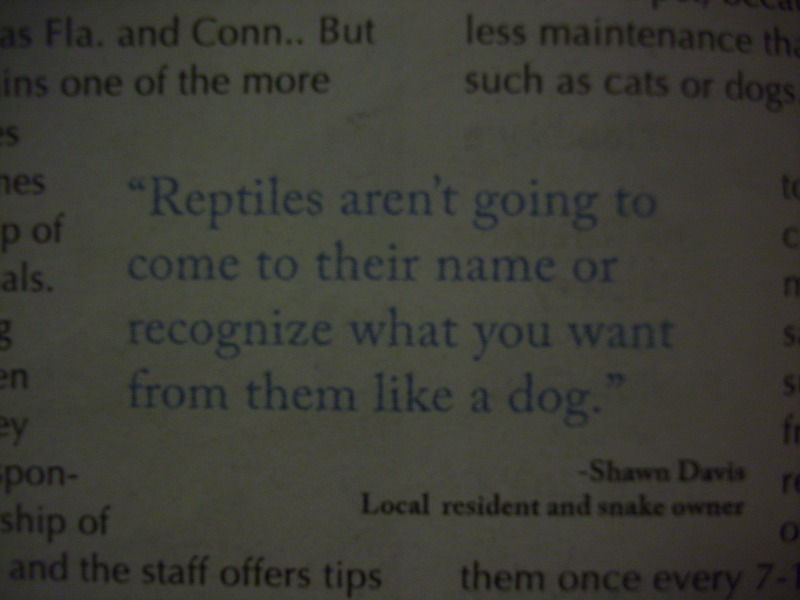 I bet that this quote will prevent a lot of unsuspecting people from buying an anaconda in the hopes that one day they might teach it how to fetch. Also, this quote really answers a lot of questions about what I thought was my dog. 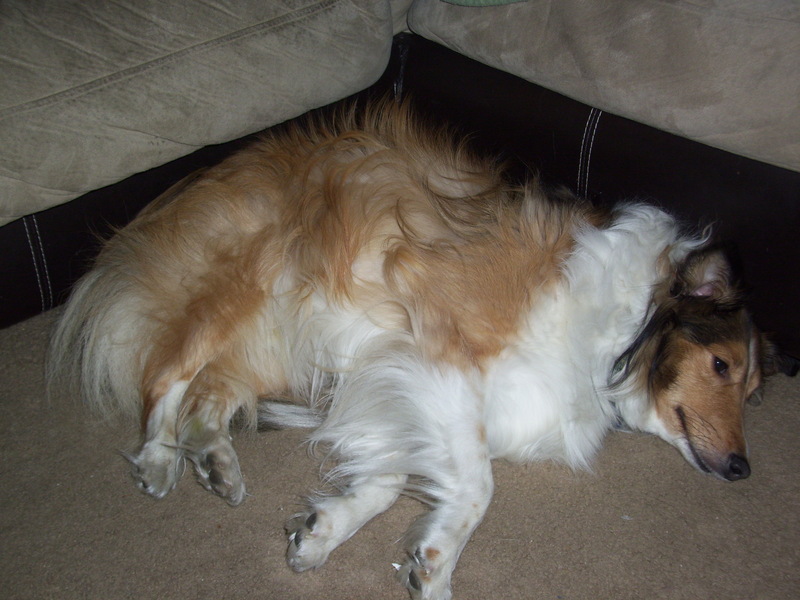 He doesn’t usually care if I’m calling his name, and he really doesn’t seem to recognize what I want from him (especially when what I want involves him stopping whatever misbehavior he’s involved with at the time). He MUST be a reptile. That explains everything! And then the sidebar. I really, really love the sidebar. 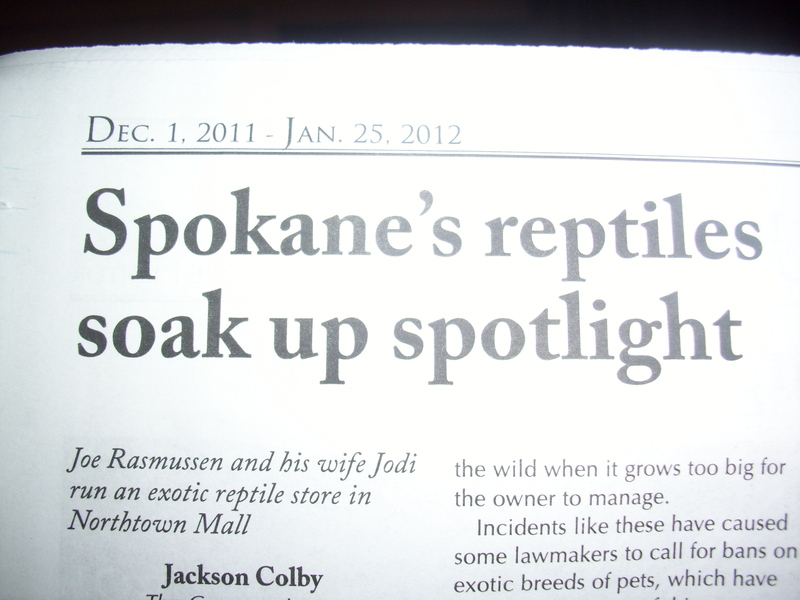 "Illegal Exotic Pets in Wash"
Finally, perhaps my favorite part of the article is the sidebar. First of all last time I checked the abbreviation for Washington State was WA, but since this says “Wash,” these pets are either illegal to own in Washington or illegal to put in the wash. 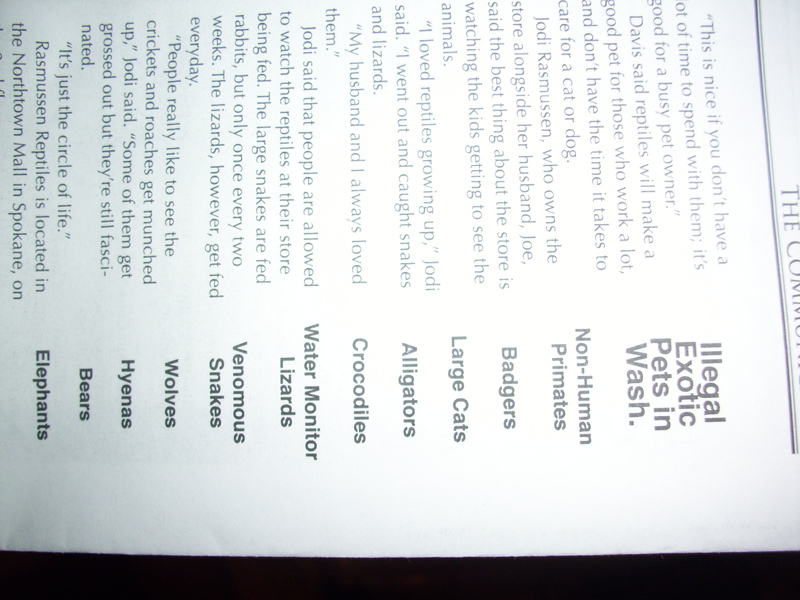 Either way, I am firmly opposed to putting any pets, exotic or not, in the washer. That’s just not cool. Non-Human Primates: I was a little concerned about this at first, but since the list specifies that it’s non-human primates, I’m relieved. I was afraid that perhaps I was keeping my children illegally. But since I’m over 95% sure that they are human primates, then we should be in the clear. Also, if any of you were considering getting a human primate as a pet, rest assured that it’s not illegal in Wash.
Badgers: No problem here. I have never wanted a badger. Those little guys have a reputation for being mean. However, apparently this list doesn’t 86 beavers. So if you’re disappointed that badgers are off the list, consider gifting a beaver this Christmas. Large Cats: Due to the fact that this list doesn’t really define “large cats” I’m a little worried. 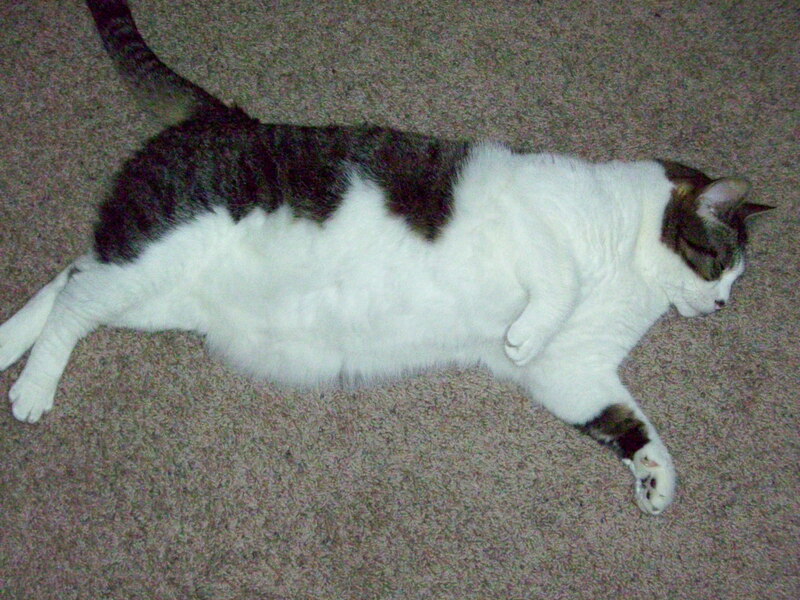 I know that tigers, cougars, and pumas are out, but what about our beloved Fat Buttons? Everyone who comes into our house marvels about how huge he is. Is our adorable large cat an illegal in this state? If so, since he’s been living here for over six years do you think they’ll grant him amnesty? I'm not fat! This fur just isn't very slimming on me. Alligators and Crocodiles: I have no issue here. My bathtub certainly isn’t large enough. Water Moniter Lizards: I actually had to google these bad boys, and as soon as I read that they can grow to be over 10 feet long and weigh up to 55 pounds, I was convinced that they deserve their place on the no-go list. I’d actually be willing to sign a petition to keep them there. Venomous Snakes: I’m glad that these aren’t allowed as pets in Washington (or the wash – we never really cleared that up). I wish that they weren’t allowed in camping areas either. Wolves: Oh, man. I totally wanted to try to tame one. Perhaps I can tame a coyote since they aren’t on the list. Hyenas: I only know hyenas from The Lion King, but based off of their portrayal in that, they don’t seem like very good pets. Bears: Not even a little black bear cub? But they’re so cute! And finally, Elephants: First of all, to me elephants would be very impractical in Washington. It’s cold here. Based on where they’re from, I assume elephants like to be warm. That would take a lot of blankets. However, with only elephants and big cats being excluded from your safari pets, that still leaves plenty of ridiculous options. Zebra, giraffe, or hippos, anyone? All in all, this article definitely wins my vote for most thought-provoking part of the school paper.